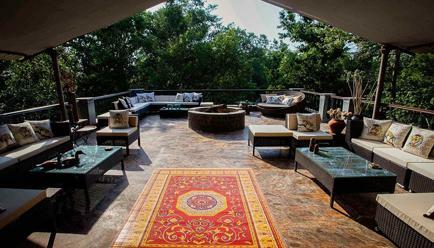 Home to Bengal Tigers, Hard Ground Swamp Deer, Asiatic Leopards and many other rare wildlife species, the Singinawa Jungle Lodge is located at the illustrious Kanha National Park. 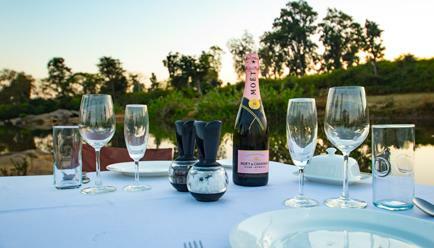 With curated experiences like jungle safaris, guided nature walks and exotic spa treatments, it offers travellers a diverse range of activities to rejuvenate in the lap of nature. But that’s not all there is to this majestic place, it also promotes ecologically responsible tourism giving vacationers an insight into the natural habitat of certain extremely endangered animals and birds. 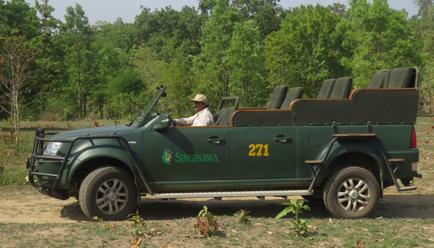 Spread across a vast expanse of 100 acres of forest land, Singinawa’s offerings are the very definition of luxury. 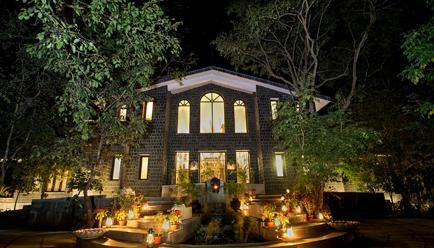 Right from the aesthetically designed cottages to the exclusive ecological experiences, every detail has been crafted carefully to give travellers a sensorial delight. 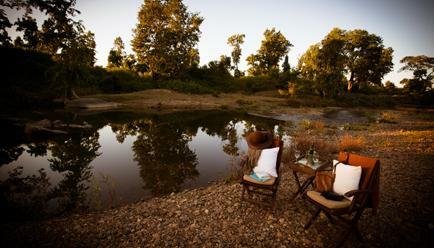 One of the first tiger reserves in India, Kanha National Park is the largest national park in central India. Its rich ecosystem houses the highly endangered hard-ground barasingha, dhole, gaur and about 300 species of birds. Its dense foliage features a host of herbs, climbers and shrubs that add to its biodiversity. 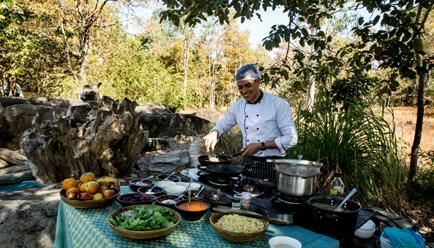 There’s much more to Singinawa than opulence and indulgence, it’s a place where nature comes alive in every form. It’s a place that makes you feel one with the wild. Be it a jungle safari, a tribal village tour or a nature walk through the meandering meadows, all of them give you a sense of cohabitation. 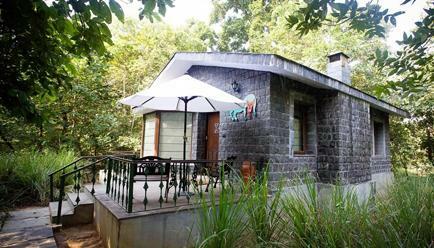 The intricately designed stone and slate cottages come equipped with large king-sized beds, bathrooms with double vanities, rain showers and private verandas so you can soak in the beautiful view. 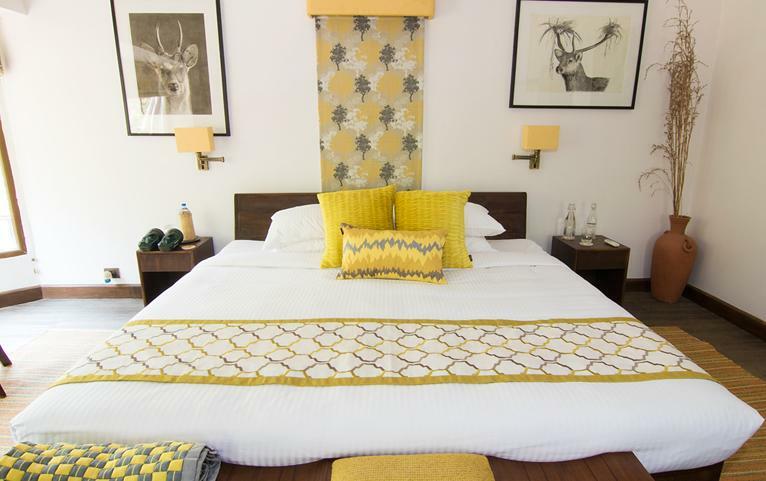 Whether you wish to lounge, sip some bubbly, catch-up with work or read by the fireplace these cottages leave nothing to be desired. 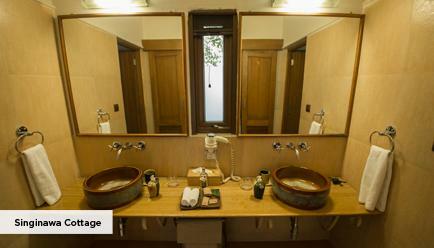 With each cottage being wide-apart from each other, you can relish your solitude in absolute. Surcharge: Please check the booking calendar for the surcharges mentioned alongside the travel dates. Partial Prepayment: Partial prepayment options are available for certain deals. For further information, please do not hesitate to contact our Travel Concierge team, by Email (travelconcierge@fabgetaways.com) or by phone (+919099061000). Validity: Each package is valid for two adults. 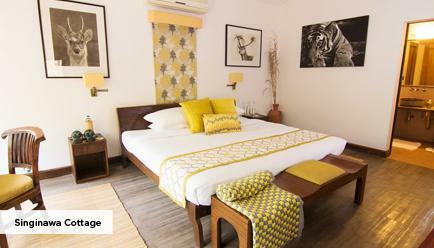 Maximum Guest Capacity: The maximum room capacity is two adults and one child (aged below 12 years) or 3 adults. 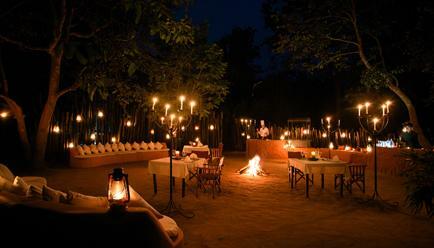 Extra Guest Policy: Where applicable, an extra adult can stay at a surcharge of INR 4000 per night, with an extra bed and the inclusions available in the package, payable directly at the resort. Child Policy: A child aged between 0-5 years may stay free of charge. Where applicable, a child aged between 6-12 years may stay at a surcharge of INR 3000 per night, which includes an extra bed and the inclusions available in the package, payable directly to the resort. Wi-Fi connection is available only in the lounge, restaurant and main lodge. In-House Naturalists: Go on a jungle safari in a customized 4x4 vehicle or take a tour of the local ecosystem, Singinawa’s trained in-house naturalists will ensure you have the most insightful experience. 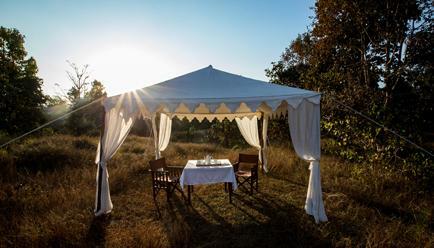 Experiences: Singinawa offers many experiential services like bicycle rides into the nearby tribal village, nature walks, tours to the model organic farm, day trips to the Phen Sanctuary and many more. 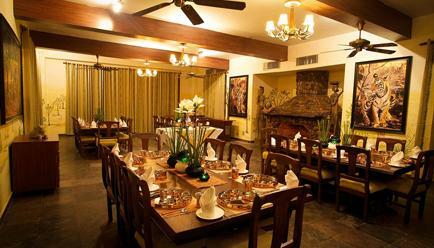 Dining: With 7-8 dining spaces and a fully-stocked international bar, Singinawa has many epicurean delights to offer. 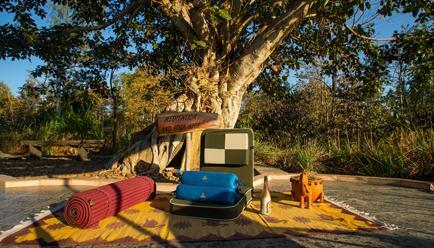 Whether you like sitting under the sky or enjoying a cosy meal indoors the lodge won’t disappoint you. 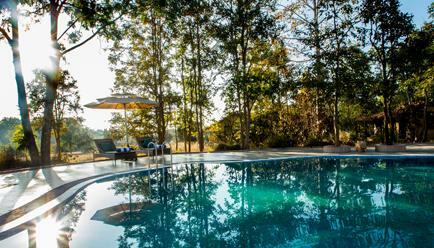 Swimming Pool: The Wallow pool at the lodge overlooks lush grasslands and rock formations that add to its elegance. 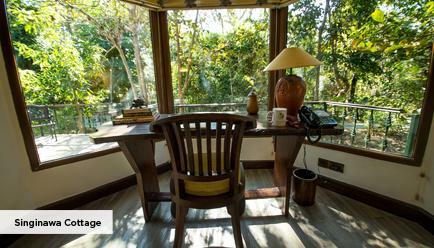 In-house Library: The well-equipped library at the lodge features a sizable collection of wildlife books for your reading pleasure. Spa: The Meadow Spa offers Indian and Oriental treatments for a luxuriant and therapeutic experience. 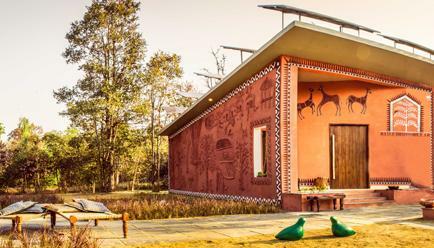 Kanha Museum of Life & Art: Featuring installations and artworks of the local Gond and Baiga tribes the Kanha Museum is a place where art and culture live in a symphony. 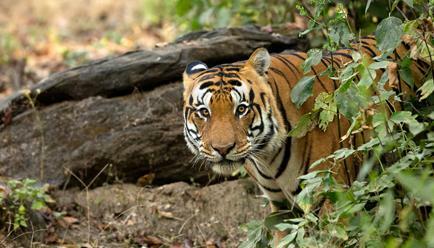 The Kanha National Park is in Madhya Pradesh and can be accessed from the cities of Jabalpur, Raipur and Nagpur; Jabalpur being the closest railhead and airport. All the major cities of India be it - Delhi, Mumbai, Kolkata, Bangalore, Chennai or Goa, have one-hour long flights to Jabalpur, Raipur and Nagpur on regular intervals. After reaching one of these cities one can travel by road to the national park. The distance between the park and the nearby cities are as mentioned - Jabalpur 200 km (3.5 hours), Raipur 213 km (4 hours), Nagpur 270 km (5.5 hours). The closest railway station to Kanha is Jabalpur. All major cities have regular trains to Jabalpur. On reaching Jabalpur, one can reach Kanha by road. 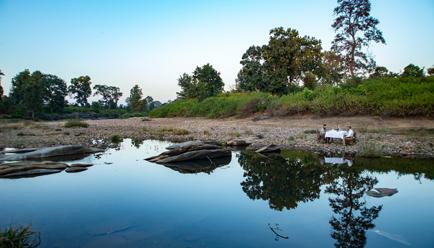 The park is about 200 kms away from Jabalpur and takes around 2.5 hours to reach.